​The waters are moving too fast.. so quickly you cannot step in without getting carried away. The waters are full of trash and debris.. muddy and murky. In a clear cove, seated on grass, surrounded by tress... be still. Mother bear brings healing... wants you to imbibe living foods. Father moose brings power and grace within purpose. Moose eats plants of the water... nourished by nature. Knows peace. Be what you are. When the waters are still, you see your reflection. What you are, is what you experience. What you ARE is what you experience. Still the waters. As it turns out, this was a premonitory dream. 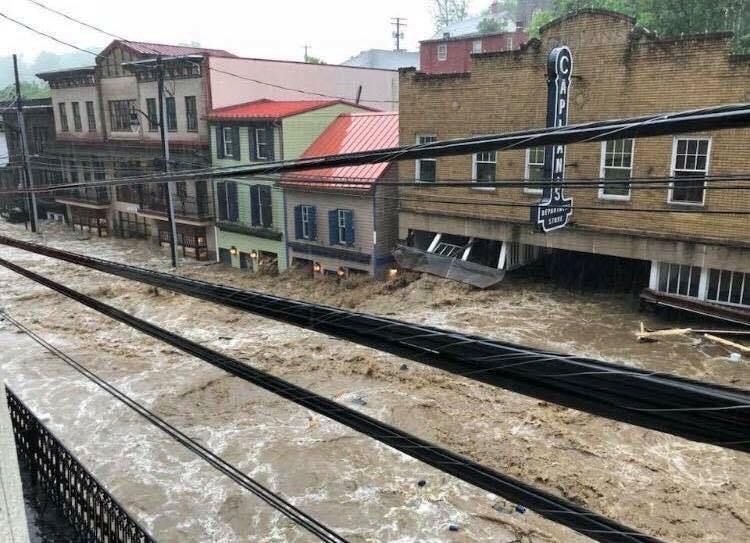 The waters of Ellicott City (where my humble shop is located) swelled and flooded the town. The rushing, murky water carried all manner of debris, furniture, and the precious collectibles which the town is known for... all washed down stream. 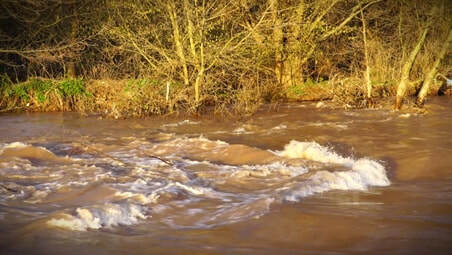 It was a warning that the waters need to be stilled to prevent disaster. 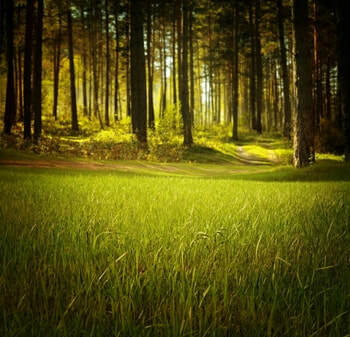 We are called to add more green space where the water can be absorbed into the earth. Days prior to this dream I dreamt of a bustling, well-to-do town built atop old spiritual resting grounds. The dead were being disregarded. Within the dream I saw a pool of water, a swimming pool, in which a spirit dwelled. She pulled a man deeper into her underwater world... he would die there. There was another man close behind him, trying to avoid the same fate. Regrettably, a man did die during the Ellicott City flood of 2018. May his spirit find rest. But what can I possibly do with such a premonition? With such a knowing, even now? My friend & business partner at the Ellicott City space, Charlene, and I went to the nearest river to offer flowers petals and prayer. We asked that the citizens of the town-- those of influence and political weight, be given insight into what is needed at this time. We prayed that the river be given a voice so that the rain's water could penetrate into the earth and water dry bones; so that the land could be nourished by water. Because the people continue to overdevelop the area, the land is dwindling fast. It has been a month or so since the flood and Charlene and I are just about to move our items back into Taylor's Collective, on Main Street. The fact that I just recently had another dream of Ellicott City doesn't lend to my enthusiasm about moving back in just yet. In the dream I saw myself beneath the buildings, shoveling dirt back into place with my hands. The foundations were weak. I had to give up my efforts when I saw watery dirt flowing toward me. I heard the word, "sinkhole." It was not finished. So I dropped the dirt and ran above ground to warn everyone to run.. I urged them to run away from the center, toward the City Hall. Of course, this time I warned a citizen of Ellicott City-- the kind woman who first offered to feature my items in her shop. Two days before this dream, I dreamt of this woman in an all white apartment high up in the air. The couch was white, the walls were white, everything was white and beautiful. Looking out her window however, I could see only concrete and traffic.. there was no water. So this is the woman I warned about the sinkhole. As I told her, this is one time I hope to be wrong. I hope that the dream was simply my own fear taking form... I do feel great empathy for the town's people and for the ancestral spirits there, also for the residents of the animal and spiritual realm who are there. I continue to listen and to pray for a resolution which serves all involved.